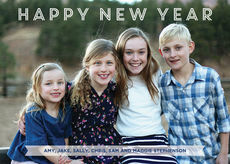 Celebrate the season with our Happy New Years foil stamped holiday photo cards. Matching blank envelopes are included. Photo cards come with a fully designed card back as shown. Size of photo cards.. 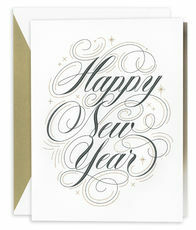 Send New Year wishes with this beautifully engraved Happy New Year design. You select inside greeting. 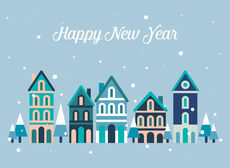 Your signature line will be printed in the same typestyle as shown on the greeting selected in..
Set of flat New Year cards with matching blank white envelopes included. Card size is 7" x 5". Your choice of card shape. Your greeting will be flat printed in gold ink as shown using.. Celebrate the season with our foil stamped Christmas photo cards with a gold foil Holidays design. Matching blank envelopes are included. Photo cards come with fully printed card back. Size of photo.. 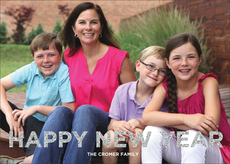 Celebrate the season with our foil stamped New Year photo cards. A silver frame surrounds your favorite photograph. Matching blank envelopes are included. Photo cards come with a fully printed card.. 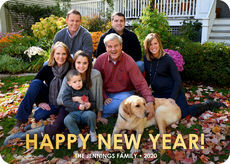 Celebrate the season with our foil stamped Christmas photo cards with a gold foil Happy New Years Starburst design. Matching blank envelopes are included. Photo cards come with a fully designed card.. 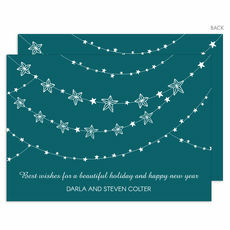 Send your holiday wishes to friends and family with this set of modern flat holiday cards. Flat printed in ink color as shown with your choice of typestyles. Full back design as shown included. Size.. 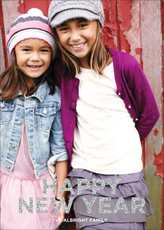 Send your holiday wishes to friends and family with this set of trendy foldover holiday cards. Inside imprint will be flat printed in navy ink color with typestyle of your choice. Size 7" x..
Set of stylish photo cards featuring your favorite photo. Blank white envelopes. Sized 7" x 5". Printed return address in flat navy ink and optional envelope linings available. Your signature line.. Celebrate the season and announce your new address with these moving photo announcements with a gold frame accent. Matching blank envelopes are included. Moving announcements come with a full colored.. Send your holiday wishes to friends and family with this set of modern flat holiday cards featuring our pink garland of stars. Flat printed in ink color as shown with your choice of typestyles. Full.. 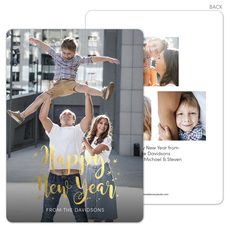 Celebrate the season with our foil stamped New Year photo cards featuring a gold foil frame surrounding your photograph. Matching blank envelopes are included. Photo cards come with a fully printed..